Vardis have revealed they’ll release their fifth album Red Eye in May. The album launches on May 20 via SPV/Steamhammer on digipak CD, vinyl and on digital formats. 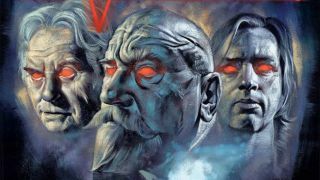 It features artwork by Graham Humphreys, who has previously produced work for Hammer Studios and posters for movies including Nightmare On Elm Street, Evil Dead and Evil Dead II. Vardis lost bassist Terry Horbury last year after a short battle with cancer. He was replaced by Martin Connolly, but Horbury’s playing remains on the album and his image is featured on the sleeve. Frontman Steve Zodiac says: “We are very lucky to be able to welcome Martin Connolly to the band. Despite knowing Vardis would continue, after losing Terry so suddenly it took some time before we could consider playing with another bassist. “By the time we were ready, the job required someone with the musicianship and experience not only to maintain the power of our live shows but to form a tight chemistry quickly.